CME review articles. Peer-reviewed research. Peer-tested content. Psychiatric Annals, a monthly medical review journal, is dedicated to providing psychiatrists, psychiatric nurses, and medical professionals with an interest in psychiatry with the vital information required for optimal patient care. In an ever-changing specialty, the Journal provides practitioners with physician-reviewed single-topic articles for CME credit, peer-reviewed research and case reports, as well as peer-tested journal summaries and physician perspective. Whether in print or online, Psychiatric Annals is a trusted resource for high-impact specialty knowledge in the diagnosis and treatment of mental health disorders. 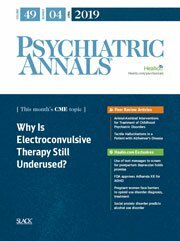 Why Is Electroconvulsive Therapy Still Underused?